Finally! A non-alcoholic, triclosan-free, organic, soap-free, non-irritating, moisturising hand cleaner! Our convenient, moisturising, Timeless Natural Hand Cleaner is ideal for all skin types. Great to use anywhere there’s no water available to wash hands. Organic lemon, rosemary and lavender extracts, which provide the natural antiseptic and astringent qualities, are teamed with organic aloe vera, olive oil and gluten-free wheat germ oil extract to soothe, hydrate, nourish and protect the skin. The travel-sized tube makes it suitable for flying and storing in purse, desk drawer, nappy bag or child’s backpack. Completely free of alcohol, triclosan, benzalkonium chloride (BAC), parabens, phthalates, petroleum solvents, sulphates, artificial colours/dyes, gluten and GMOs. The product has never been tested on animals, and there are absolutely no animal ingredients in it. The packaging is also BPA-free. HOW TO USE: Unlike alcohol-based cleansers, you only need a couple of drops of this product. Shake well, then dispense and massage into your hands for no more than 30 seconds. If it takes longer, you have used too much! Your hands will feel silky smooth. Keep a bottle on hand in your purse or nappy bag for those times when there is no other way to wash your hands, or when there are no paper towels in the public restroom. COMPLEMENTARY PRODUCTS: Timeless Relaxation Rescue Gel for an “on-the-go” solution to staying calm and relaxed, Timeless Lip Balm, and a Travel Envirocloth to sanitise surfaces while you are out and about (cafe tables, shopping trolley handles, picnic tables etc). 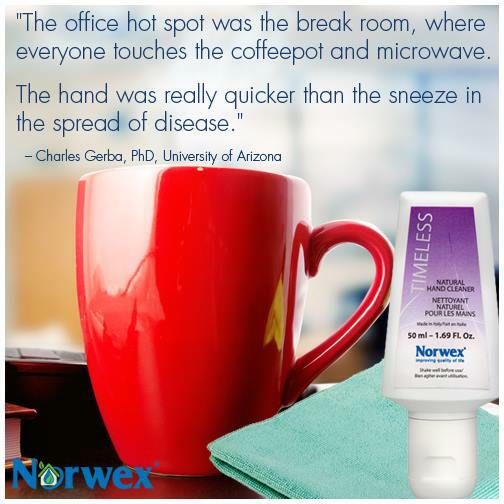 You can buy the Norwex Timeless Natural Hand Cleaner online from me, in Australia. Or you can buy it in New Zealand here. If you are elsewhere, check Norwex.com to find a consultant in your country.